“There’s nothing wrong with New York that a million Chinese couldn’t cure,” the urban geographer George Sternlieb once quipped. It may be an exaggeration, but rising Asian immigration has indeed been a boon to many communities and economies across the country. Over the past 30 years the number of Asians in America has quadrupled to 18 million, or roughly 6% of the total U.S. population. But their economic impact is much greater. They are far more likely to be involved in technology jobs than other ethnic groups, constituting over 20% of employees in the nation’s leading technology companies, four times their share of the overall U.S. workforce. And then there’s the line of connections to the most dynamic economies on the globe: India, South Korea, Singapore and, of course, China. Asia has become the nation’s largest source of newcomers, accounting for some 36% of all immigrants in 2010. Asian immigrants and their U.S.-born descendants tend to be better educated: half of all Asians over 25 have a college degree, almost twice the national average. They earn higher incomes, and, according to a recent study by the Pew Research Center, are more likely to abide by “traditional” values, with a stronger commitment to family, parenting and marriage than other Americans, and a greater emphasis on education. To find out where Asians are settling, we asked demographer Wendell Cox to analyze the most recent decennial Census. As expected, the largest Asian communities are in the largest metro areas, led by New York and Los Angeles with almost 1.9 million Asians each — twice the magic number cited by Sternlieb — followed by Chicago. But our analysis found that in search of opportunity, Asians are increasingly headed to regions that, until recently, had very few Asian immigrants. And throughout the country, Asians, following a trend that has been developing over the past two decades, appear to be settling primarily in the suburbs. Similar to the pattern we found in a survey on the migration patterns of bachelor’s degree holders, Asians are increasingly settling not in the established hubs, but in younger, more vibrant and growing cities that are mostly in the middle or southern half of the country. Although greater New York’s Asian population grew by an impressive 500,000, up 40%, our analysis of the 2010 Census numbers found a higher rate of growth — more than 70% — in relatively new destinations, Dallas and Houston. Several smaller cities also saw bigger percentage gains during the 2000s: the Asian populations of Raleigh, N.C., Charlotte, N.C., Indianapolis and Phoenix all rose by 100% or more. Growth was much slower in traditional Asian centers: 57% in the Washington metro area, and 52% in Seattle. The Asian populations of the Los Angeles and San Francisco areas expanded less than 25%. Overall, it is clear that the Asian population, although still largest in the biggest metros, has been dispersing to other parts of the country. But that’s not the only way Asians are dispersing. We are witnessing a continued shift of Asians to suburbia in almost all regions. Increasingly, the real Chinatowns, Koreatowns and little Indias of America are in the inner and outer suburban rings, notes Tseng. The inner city is largely the province of the elderly and recent immigrants. For example in the New York area, the Asian population grew both in numbers and in percentage terms far more rapidly, 48%, in the suburbs than in the city, where growth was under 30%. This trend was even more stated nationwide. Nationwide over the last decade, the Asian population in suburbs grew by almost 2.8 million, or 53%, while that of core cities grew 770,000, or 28%. This trend is evident as well on the West Coast, the traditional hub of America’s Asian population. In Seattle, the core city added 11,000 Asians over the past decade while the surrounding suburban ring added 124,000. The big growth in diversity around the Puget Sound is taking place not in the city of Seattle, but in suburban hubs like Bellevue (population: 122,000). Asians have come to constitute over 27% of Bellevue’s population, twice their percentage in the city of Seattle. Similar patterns can be seen in other Pacific coast cities. In the San Francisco Bay region the suburban Asian population grew by 186,000 compared to 24,000 in the urban core; a growth rate, at 35%, almost three times that of the local core. An analysis of Asians working in Silicon Valley — where by some estimates they now constitute a majority of computer industry workers — finds this population moving further away from the urban core, particularly to areas with concentrations of single-family housing. In Los Angeles, the nation’s largest Asian region, the suburbs added roughly five times as many Asians as the core city. In, there are now roughly three Asian suburbanites for every core city dweller. These pattern are even more marked in cities that are just now becoming Asian hubs. For example, the city of Plano (population 270,000) in the northern suburbs of Dallas is almost 17% Asian; Dallas itself is only 3% Asian. 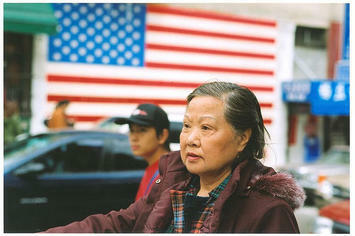 Photo "asian american" by flicker user centinel.